Here are some of the artists that are playing Dudley Violins or Guitars and what they have to say. There are also some links to other music sites. 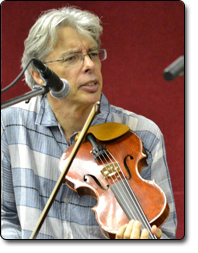 Darol Anger is certainly one of the most influential violin players in the world today. His style and teaching methods are used by so great players of our time. Darol Anger is playing a Dudley 5 string that Barry nicknamed "Frankenstein" as he was making the violin. 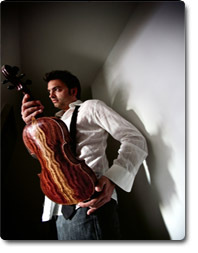 Oriol lives in Barcelona, Spain and is a phenomenal violinist. He plays many styles but is classically trained. Oriol and "The Barcelona Bluegrass Band" have a new CD out and Oriol used the 5 string I made for him to record the whole thing. If you Google Barcelona Bluegrass Band you can hear and download the great music! Oriol is also with the "Folkincats" which is a great jazzy flamenco group. Bobby Hicks, winner of 10 Grammys and has three Gold Records and one Platinum. 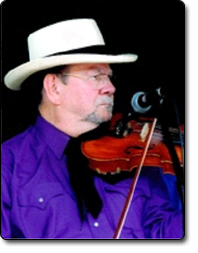 Bobby was inducted into the "Fiddlers Hall of Fame" in 2002.He has also been at the Grand Ole Opry for 58 years. Bobby has played with Legends like Bill Monroe and Ricky Skaggs. Bobby is playing a Dudley 5 string along with his beloved "Golden Boy". Shane is playing a Bubinga 5 string violin I made for him. Currently touring with multiple JUNO and CCMA winner and Canadian country star, George Canyon. Also touring with rising Canadian star Jason Blaine and a highly active session player. Shane and George Canyon have just come off tour with Alan Jackson and are about to go out with Brooks & Dunn for their "Last Rodeo" tour. 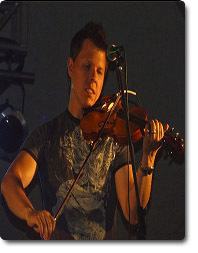 As you can see, Shane knows his way around a fiddle! “I have always wanted a good 5 string fiddle, but could never find an instrument that was the right fit for me. Then I found Barry Dudley. Up until recently I had played the same acoustic fiddle for 20 years! Always looking, I could never find a fiddle that had the sound I wanted 'and' was a 5 string. Hesitant to buy an instrument I had never touched, I corresponded with Barry for months before actually making my order. He always answered my questions and never pressured me to buy. Being the cautious consumer, I did a lot of checking up on Barry and his fiddles. After reading many reviews, listening to sound clips and talking with several Dudley 5-string owners, I was convinced!! Barry did not disappoint. He talked with me even more extensively about what exactly I wanted in a fiddle. Together we determined every detail of the fiddle that was being built for me, from choice of wood (African Bubinga), finish, pick up and peg choices and even what type of strings I would like it strung with. When it arrived it was beautiful and ready to walk right on stage. In fact I played it on a gig the very night I got. “After years of making do with the same fiddle since I was 9 years old, I have finally upgraded in a big way. The biggest difference in my musical life has been my new 5-string fiddle, built by Barry Dudley. I can't even begin to explain how much I love this instrument, but I'll try! Several months back, Barry had approached me about building a custom fiddle, and we started a dialogue about what we both liked in fiddles (balanced, big, slightly dark sound), and how creative we wanted him to get (very). Barry built the back, sides and neck out of Bubinga, an African wood often used by luthiers for harps and bass guitars. It has been used in high-end drum shells as well, but I have never heard of it being used in violins or violas. I have been so impressed by this fiddle – I've done several studio sessions now since picking it up a few months ago, and there are a couple of things that I've noticed. Usually when fiddles/violins are new, they lack depth and balance – they sound immature and are often unusable for recording for several years until they round out a bit. This fiddle sounded great from the moment I started to play it, and as it matures I am starting to get a sense of just how fantastic it's going to be in 5, 10, 25 years from now. I have officially demoted my beautiful sounding, reliable 110 year-old fiddle/violin that I've had since I was 9 to "second fiddle" (ha-ha) in favor of this 9 month old baby monster. Over the past 8 years, Christian Sedelmyer has become one of the most in-demand fiddle players in Nashville. He has recorded or performed with Emmylou Harris, Vince Gill, Jerry Douglas, Kacey Musgraves, Darrell Scott, Tim O'Brien, Buddy Miller, Jim Lauderdale, Peter Rowan, Steve Earle, Alison Brown, and The Indigo Girls. In early 2012, he started the band 10 String Symphony with fellow fiddle player, vocalist and clawhammer banjo player Rachel Baiman. Their latest release, Weight Of The World (Oct. 2015) reached #3 on the Billboard Bluegrass Charts, and was featured on NPR's All Songs Considered. 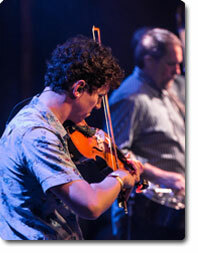 Christian joined the band of 14-time Grammy winning dobro master Jerry Douglas in the summer of 2014. This setting particularly provides an incredible pallet for Christian's improvisational prowess. He plays a Barry Dudley 5 string violin that he's nicknamed Reese's for its contrasting brown and orange color scheme. David Blackmon has played with such greats as Jerry Reed, Randy Travis, Driving and Crying, Collective Soul and the Allman Brothers to name a few. To say he is “A Monster“ is an understatement! David used a Dudley 4-string to record their new album “Faces“. He is currently playing a Dudley 5-string. Not only is David a valued customer, he has become a true friend! 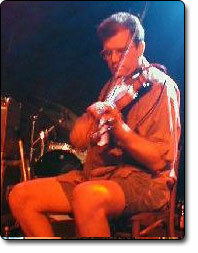 Dave plays and teaches bluegrass, old-time, Irish, and swing in the Boston area. Twice Wisconsin State Fiddle Champion, he's also won many Northeastern contests and has written three fiddle instruction books for Mel Bay Publications: Old-time Fiddling Across America (with Pete Anick), Anthology of Fiddle Styles, and Anthology of Jazz Violin Styles (with Glenn Asch). He's composed a number of excellent tunes, including Canyon Jig, Out the Window, Dave's Bulgar, New Road to Sligo, and Slider's Reel (which has been recorded several times and even played at the White House). Patrick Daly is a composer, educator and fiddle player form Dublin, a graduate of the Masters Degree in music and media technology from Trinity College Dublin. I encouraged Patrick to give me more information about himself but he is too modest! Not only is he a great musician but a really nice guy. 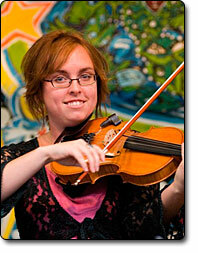 Jessie Burns is an extremely talented Celtic fiddler touring Europe playing with a group signed with Columbia Records. Jessie is playing a Dudley 5-String! 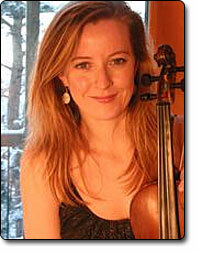 Lyndsay Pruett is a young and extremely versatile violinist. She lives in Nashville, TN and plays in numerous projects including Futureman's Black Mozart Ensemble., Lindsey is also a sessions player and used her Dudley 5 string to record the title track for the James Bond movie, Quantum of Solice. Lyndsay graduated from Belmont University with a major in Commercial Violin Performance and is now among the few young string players in Nashville who are doing sessions and various gigs around town. She loves her new Dudley fiddle because it has expanded her voice and vocabulary into a new range that is delightful to her musical sensibility. Check this site out! 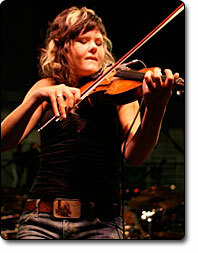 www.fiddlingaround.co.uk/ Chris Haige has this site that showcases all types of Jazz Fiddle information from around the world.